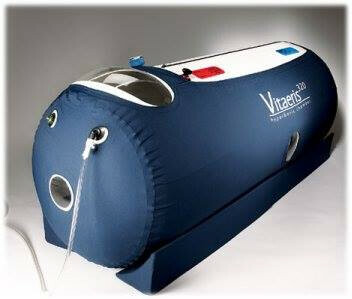 Hyperbaric Oxygen Therapy- putting the amazing healing power of oxygen to work for YOU. There is no more precious and life-essential element on the face of the earth than oxygen. Oxygen, the most abundant chemical element in the Earth’s biosphere, is essential to most terrestrial life. We know that if we fast, we can live a few days without water and a few weeks without food, but we can survive only a few minutes without oxygen. To put it another way, without oxygen there would be no life. While we can all understand the importance of oxygen to life, few of us realize or appreciate its therapeutic and healing power for the human body. At Guyer Institute, we put these amazing properties to use in our Hyperbaric Oxygen Therapy (HBOT). Using a high-pressure chamber located in a private area of our Synergy Spa, HBOT is effective in treating a wide range of disorders. Everything from wounds, burns, infections, illnesses, to sports-related injuries and inflammatory conditions are helped by Hyperbaric Oxygen Therapy. For example, concussions in sports are presenting an increasingly prevalent issue. Guyer Institute has treated patients with this condition using HBOT. We posted a story on our Facebook page on Jan 4, 2016 entitled “3 Cheers for Hyperbaric Oxygen Therapy” about Jacqueline, a Purdue cheerleader, who suffered a concussion. HBOT reduced her symptoms in just three treatments. She ultimately was able to resume her passion of cheerleading at the university. The location of our Hyperbaric Chamber in our Synergy Spa makes it convenient for another use…to rejuvenate skin. Hyperbaric Oxygen Therapy dramatically diminishes the appearance of wrinkles in the skin and directly encourages overall skin health. Have you ever peeked in the mirror after exercising? You may notice that your skin glows. Your entire face is flushed pink. This is a good sign, evidence that the outermost reaches of your cells have been bathed in oxygen-rich blood. HBOT can renew damaged skin because it bathes the cells in your body with oxygen. And, because the chamber is pressurized, oxygen easily enters into every tissue of the body. In a pressurized, 100% oxygen environment, HBOT improves circulation to your skin by supplying your cells with much-needed oxygen to improve sagging, wrinkles, and even age spots. Not only can HBOT be used to treat a wide array of serious health conditions, it just makes you feel good, while serving as a popular alternative to abrasive creams, ointments, or harsh procedures for renewing aging skin.